Want to make the perfect first impression on all your guests with gorgeous, lush grasses? O’Grady’s Landscape eliminates the hassle of caring for your lawn with sod installation and ongoing maintenance services catered to the needs of clients throughout the Northern Virginia area. Whether you’re looking to repair a damaged lawn or install a new one, laying sod can be the perfect alternative to installing seeded grass, allowing the roots to properly establish themselves for better growth in the future. Give your lawn a little TLC—call O’Grady’s Landscape today at 703-533-5001 to schedule sod installation in Great Falls, the City of Falls Church, North Arlington, Vienna, or McLean! Site preparation. Our landscapers begin the process by removing old grasses and smoothing out existing topsoil in order to prepare your lawn. Topsoil addition. Next, we spread an additional layer of topsoil over this same area. We take careful attention to fill low areas within your lawn and ensure any plant beds are well established. Sod installation. Once the lawn has been prepared, we can begin sod installation, ensuring that the space is even with no gaps as we do so. Wrap up and clean up. Once we’ve completed installing new sod grass, we’ll clean up your lawn to remove any debris for a clean look. Then, we’ll wrap it all up by watering your new sod gross to ensure continued growth and strength after we leave. Once you’ve completed sod installation for your Northern Virginia home, you should also consider any ongoing maintenance you’ll need to retain that beautiful, lush look. Of course you can handle it yourself—or you can just have O’Grady’s Landscape do it for you! We make it easy on our clients by offering comprehensive lawn care packages that cover all your needs, from leaf removal to fertilization and more. We even offer a weekly lawn mowing service so you won’t have to worry about any of the details. When it comes to sod installation, choosing the right landscape company is critical to the success of your project. It’s important to ensure the company you choose is knowledgeable in industry trends and has the right experience and equipment to get the job done right. At O’Grady’s Landscape, laying sod is our specialty. Our landscapers are highly skilled and we understand the landscape in Northern Virginia well, having spent years perfecting our techniques in all aspects of lawn care. 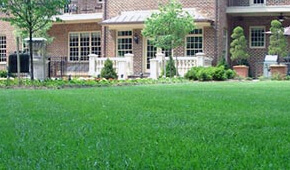 Clients all over Great Falls, McLean, Vienna, North Arlington, and the City of Falls Church have come to rely on O’Grady’s Landscape for all their sod installation needs. Call today at 703-533-5001 to schedule service and learn why!